*So I posted this Thursday morning and it ended up showing in Google reader for April 25! I'm reposting so it comes up as new in GR. Today is my last data presentation to my lab before we move, and my last day in the lab is tomorrow. It's a bittersweet transition. As much as I look forward to starting a new project in a slightly different field of study, I will miss my boss and coworkers. The saying "beginnings are scary and endings are sad" flashes through my mind a lot, because I am beginning a new chapter of my life and ending a previous one. These last few days I have been cleaning out all of my stuff from the lab, and it's actually been a pretty liberating experience - throwing out SO much makes me feel like I am starting with a clean slate, and that's always a good thing. Because this is my last lab meeting, I thought long and hard about what treat I wanted to take. If you remember, my lab gave me my KitchenAid mixer as a gift for finishing my PhD, so I try to thank them with baked goods as often as I can! I have been trying to use up what I have in the freezer, so the abundance of Michigan blueberries seemed like a good place to start. I decided to combine components of two recipes I've made in the past - adapting the Blackberry Vanilla Cupcakes to include blueberries instead, and topping them with blueberry ganache. Ever since I first made the blueberry ganache it's been on my mind. It's truly a unique flavor; as Bob put it, "the blueberries add such a brightness to the ganache." :) Someone's been watching too much Top Chef Masters and Chopped! I can't report on how the lab liked these because they haven't tried them yet! I'll update the post with the results later. I gave Bob his usual taste-testing cupcake, and he loved it - said the cupcake was nice and fluffy, and you can tell from the above quote that he likes the ganache! I had a bite of his, and it was great. Love, love, love this ganache. I HIGHLY recommend trying it - soon! I am already brainstorming up different ways to use it. As I was putting the ganache in the fridge to cool, I spotted some strawberries, so I dipped some in the ganache and put them on a separate plate to cool - awesome! One note about this recipe - the cupcakes tend to overflow if filled too high, and they bake up with very flat tops rather than rounded. I think if you fill 2/3 of the cup you'll have much better results than I did. The edges stuck to my pan and each one looks like I chewed around the entire cupcake . . . hopefully my coworkers won't mind! *Fresh or frozen blueberries, pureed in a food processor or blender and strained through a fine-mesh sieve. Approximately 1 cup of frozen blueberries was enough for me to get 1/2 cup puree. To facilitate straining the puree, whisk the blueberry mixture as you strain it through the sieve. 1. Preheat the oven to 350F and line a cupcake pan with paper liners. 2. In a small bowl, stir (or sift) together flour, baking powder, and salt. Set aside. 3. In a liquid measuring cup (or small bowl), whisk together the milk and blueberry puree. Set aside. 4. In the bowl of stand mixer, cream together the butter and sugar on medium speed until light and fluffy. 5. Add the eggs one at a time, scraping down the bowl between additions, add the vanilla extract. 6. Add half of the dry ingredients to the large bowl and mix on low speed until just combined. Add the blueberry mixture, and mix on low until just combined. Mix in the remaining dry ingredients on low speed until just incorporated. Do not overmix. 7. Divide the batter evenly between the cupcakes, filling 2/3 full. 8. Bake 12 - 15 minutes or until a toothpick inserted in the center comes out clean. Allow to cool in the pan 10 - 15 minutes. Transfer to a wire rack and allow to cool completely. 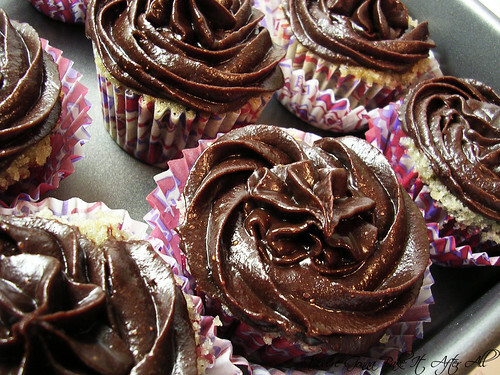 *I stored the cooled cupcakes in a covered cake pan overnight and made the ganache the next evening. This way I had time to clean the sieve and chill the ganache properly. 9. To make the ganache, place the chocolate chips in a large mixing bowl and set aside. 10. Place the blueberries and sugar in a small saucepan over medium heat. Cook and stir until the mixture becomes sauce-like and bubbly. Pour into a sieve or strainer that is placed over the bowl containing the chocolate chips to catch the blueberry liquid. Discard the remaining blueberries. 3. Bring the cream and butter to just below boiling in a small saucepan over medium heat. Pour the hot mixture over the chocolate and let stand for 30 seconds. Stir the mixture until smooth. 4. In order to achieve a consistency desired for piping, cover bowl of ganache with plastic wrap and chill until piping consistency is reached (approximately 1 - 2 hours). 5. Pipe ganache as desired (I used a large star tip). These sound incredible - especially the blueberry ganache! What an interesting addition to ganache! I don't think I have ever heard of anything like it. These look fantastic. Good luck on this new stage of life. I agree it is hard to change everything, but here's hoping things turn out great! This sounds like it has some amazing flavor combos!! Yummy. Must be so exciting to be moving on to a new chapter in life--good luck, I am sure you'll be fabulous! That sounds so interesting. 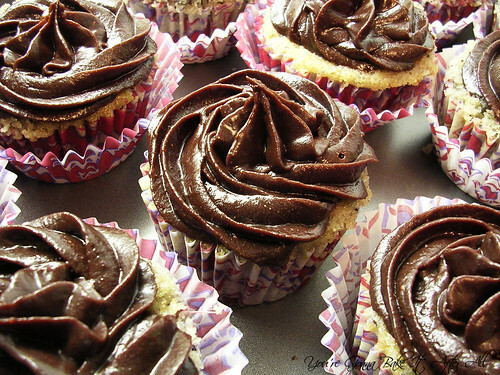 I could lick that ganache off of those cupcakes about now! Good luck in your new lab! I work for Thermo Fisher Scientific, so am always supportive of lab folk. :) I found your blog while I was Googling "Monkey Bread", and I really enjoy your recipes and your style of writing. Thanks! I can just imagine how much your lab mates loved these cupcakes! The blueberry ganache sounds so unique and indulgent! I don't think your co-workers will mind! These look positively scrumptious. Their going to miss you - and your treats! Those look wicked good, I love the idea of berries in ganache. Good luck at your new lab! Love that ganache! Good luck in your new lab! These look great. I just happened upon your blog and I really like all the recipes. I'm a fan. I also have a dedicated baking blog, if you ever need inspiration. Thanks for sharing.